We can help you purchase residential and commercial property, guiding you through every phase from preparation of the purchase agreement, easements and any other required documents, through to closing. If you are buying property, you may not be aware that you can hire an independent attorney; you are not tied to the recommendation of your mortgage company. We may be able to represent you and your bank in the purchase of real estate. We can prepare and/or review a contract for the sale of property. We will also prepare all documents necessary to sell real estate properly. Our expertise in this area includes short sales. We can help forge an agreement between a borrower and a bank or mortgage lender to discount a loan balance. We will negotiate with the lender to accept the sale amount as payment in full even though less than the outstanding amount on your loan. We can represent you and your lender. Crucial goals can hinge on the smallest legal details in the world of real estate transactions. Clear, concise contracts can help minimize risk of litigation, delay and loss. At The Hamzy Law Firm, we have a comprehensive knowledge of Connecticut real estate law. 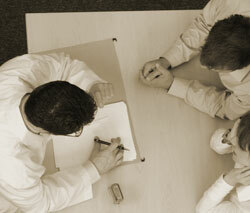 Our dedicated real estate lawyers have the experience and skills to provide you the assurance you need for your deal. Document preparation and review: Our lawyers are adept at reviewing and processing the necessary documents for a real property transfer. Title search: We will perform the title search or obtain the abstract history for the property you wish to purchase. Closing: Our real estate lawyers attend the closing for your real estate transactions, making sure that all necessary documents are executed and all concerns are addressed accordingly. Planning and zoning approval: We can help you seek and obtain all the necessary permits required for construction or renovation related to the sale or purchase of a property. Do you have a real estate transaction that requires the help of a lawyer? Contact us online or by phone at 860-589-6525. Schedule an appointment to meet with a skilled real estate attorney.